The National Football League opens the 2013 season tonight with a hotly anticipated contest between one of the favourites to lift the Vince Lombardi Trophy come February, and the current holder. Peyton Manning’s Denver Broncos host reigning Super Bowl champions the Baltimore Ravens. This is Joe Flacco (below) and co’s first step towards what they hope will be the retaining of their title and tonight’s contest will give a good insight into what sort of mind-set head coach John Harbaugh’s team are in. In some ways, this is the perfect test for the Ravens as they face a side in the Broncos that will be hurting following their play-off exit defeat to the eventual champions in the AFC Divisional Round, a game that was only settled after double overtime. History suggests that the Lombardi trophy is one of the toughest in all of sport to retain. Only seven teams have done it in the history of the NFL, including just three in the last twenty years. Take last year’s defending champions the New York Giants for instance; following success against the Patriots in 2011, they failed to even make the play-offs last season. But why is it so difficult to set about a sustained period of dominance in comparison to other sports? Free agency could go a long way to answering that question. Many teams go through major changes to their squads from year to year because of free agency; this year the Baltimore Ravens come into the season with limited expectations due to a large change in their personnel, although publicly they will state otherwise. This is just the nature of the NFL beast. With just one trophy for all teams to play for each year, it is “do or die” for most teams and the effort required to reach the sole target can often result in a drop in standards the following season. It can be argued that the pressure to succeed isn’t there for many teams during their winning season and thus becomes too much thereafter and teams cannot live up to that. This is what separates the one season wonders from the true greats. 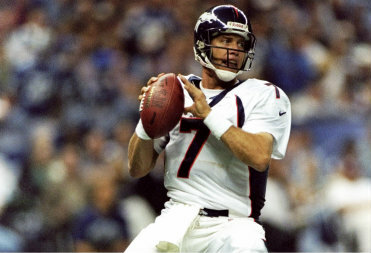 Take the teams that managed the great feat of retaining; such as the Dallas Cowboys and Denver Broncos teams of the 90s, teams led by Hall of Fame quarterbacks in Troy Aikman and John Elway (below) respectively. These franchises not only managed to keep hold of key players but also overcome the usual complacency and motivational dip that accompanies a follow up campaign. This is Harbaugh and the Ravens biggest challenge yet and will test the drive and ambition of quarterback Flacco following his signing of a new $120-million contract following last year’s success. It is not just the psychological barriers that are standing in the Ravens way ahead of the 2013 season but perhaps more so the damage to their depth chart. 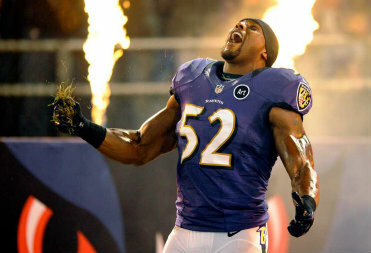 The obvious place to start would be the retirement of line-backer Ray Lewis (below). Last season, despite losing much of the agility and speed that he once possessed, he became the heart and soul of the team, adapting his game to suit his physical condition and offering as much off the field as he did on it. However, one factor cannot be ignored when discussing his diminishing impact on the field. With Lewis in the side, the Ravens were 9-1 last season, the one loss coming in a 24-23 defeat to the lowly Philadelphia Eagles, whereas without their leader they were a struggling 5-5 which is hardly title winning form. In the four play-off games, Lewis made an outstanding 51 tackles as his side’s defensive solidarity proved the difference maker. This sort of leadership is tough to replace and the Ravens may find it difficult to adjust to life without a man who has led them into battle for two decades. 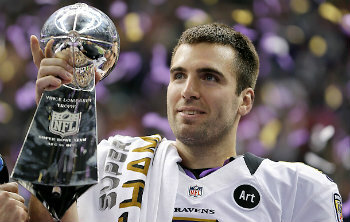 Unfortunately for Ravens fans, the loss of key players goes much further than Ray Lewis. In the post-season, they curiously let promising line-backers Dannel Ellerbe and Paul Kruger walk away in free agency to join the Miami Dolphins and the Cleveland Browns respectively while perhaps most regrettably, they lost their star safety and one of the NFL’s best centre fielders in Ed Reed to the Houston Texans. Along with Lewis, Reed was the emotional leader of the side and provided a swagger and confidence to the defence that got inside the heads of opposing quarterbacks and running backs as teams knew that they couldn’t run the middle because of the colossal Lewis, or throw deep against Reed. It’s hard to imagine how the Ravens will attempt to fill the void left by that duo. Alongside the departure of Reed is the loss of other key safety Bernard Pollard as well as special teams’ player Sean Considine. Perhaps even more alarming has been a big change on the offensive side, with veteran wide receiver Anquan Boldin being let walk to the very team the Ravens defeated in the Super Bowl last year. This followed months of wrangling between both the player and the franchise over an enforced pay cut which Boldin refused to take and eventually saw him leave. With a $120-million contract being handed out to Flacco, an absurd amount of money for a team with salary cap issues, there is certainly an air of uncertainty as to where the future of the franchise lies. Another factor facing the Ravens this coming season is the promising form of their rivals. The AFC division is stacked with talent from top to bottom. The Cincinnati Bengals are sure-fire playoff contenders for next season, led by the intelligent play of quarterback Andy Dalton. Coupled with the presence of one of the best receivers in the game in A.J. Green, they will give the Ravens two tough games next season. The Cleveland Browns had a disappointing season, but they have plenty of up-and-coming young talent, the best of which may be running back Trent Richardson, who could establish himself as one of the top running backs in the NFL next season and for years to come. Lastly, we cannot forget the Pittsburgh Steelers who have been a playoff or Super Bowl contender for nearly the past decade. Led by quarterback Ben Roethlisberger, the Steelers are a notoriously tough team and will also give the Ravens a tough examination. They will be looking to improve after a disappointing 8-8 season. It’s not all doom and gloom, however, for the Ravens in terms of their Super Bowl defence. 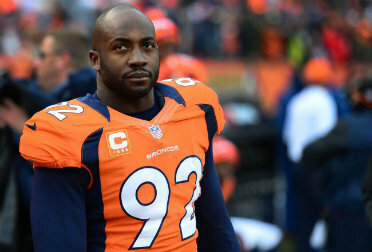 The signings of defensive end Elvis Dumervil (above) as well as safety Michael Huff will join the exciting trio of Courtney Upshaw, Pernell McPhee and Arthur Jones in what is a promising looking defensive line-up, considering what the side has lost in the post-season. Boldin apart, the Ravens have also maintained the majority of their key offensive players such as the influential Ray Rice and key tight-ends Ed Dickson and Dennis Pitta and will look to change their reputation from defence orientated to one that is carried by the million dolloar QB in Flacco. While all signs point to the usual season of struggle from defending champions, especially given the major shift in personnel, don’t be surprised to see the Ravens reach another post-season, possibly even triggered by a victory in Denver tonight.